Donations are gratefully accepted and help to defray our expenses, which include fees for additional musicians, a paid director, concert space, and costs associated with music and advertising. If you would like to make a donation, The Edgewater Singers is a 501c3 non-profit organization. All contributions made to the organization are tax deductible. Please contact us if you would like to make a credit card donation. We are available for your events! 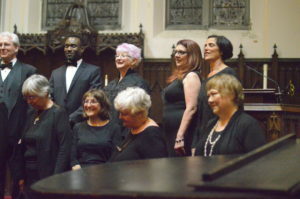 Our group performs holiday and non-holiday repertoire for private and public events. 4-8 people can perform a capella music for donations. The group has performed previously for the Andersonville Holiday sale and the French Consulate Movies at the Beach at Osterman beach. We are interested in accommodating you and your guests. Please contact us with any proposals. Please consider sharing your expertise and volunteering to help us on any of these initiatives. Contact the Membership Coordinator at newmembersews@gmail.com if you or anyone you know would be willing to assist us in continuing to grow and improve the organization.